The News Article Shortcut allows you to post news article teasers that link out to external news articles. The shortcut you create never publishes to your website and does not create a new individual news article page. 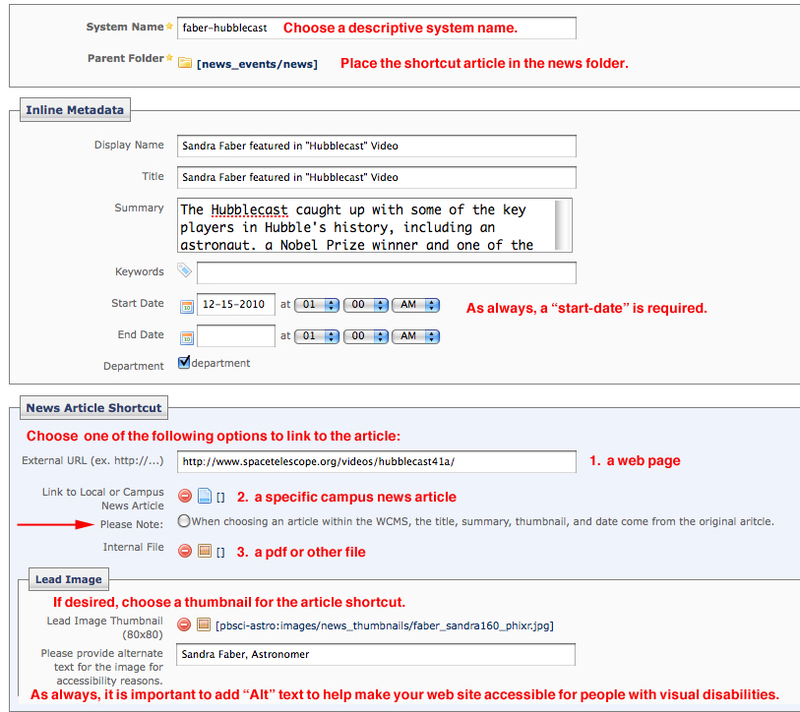 Instead, it adds an item to your News Index Page (below), which links directly out to another Web site or file. Select "News Article Shortcut" from the drop-down menu. Enter a system-name, display-name, title, summary, and start-date. Save the shortcut in your news folder along with any other news articles you may have created. Create a thumbnail if desired. Make sure to give it ALT text (a description of the image) for accessibility compliance. The News Article Shortcut does not contain the text of the article, so the shortcut does not publish to your Web site. They simply provide the title, thumbnail, link, summary, & date for the index page listing. When linking to a campus news article, the Title, Date, Summary, & Thumbnail come from the original article. If there is no thumbnail associated with the original campus article, a local thumbnail can be used if desired. Hint: give the shortcut a descriptive system-name so that you can identify it easily in the list of pages.